We arrived safely this morning after an uneventful 11-hour flight. It was the longest flight I'd been on; Ken has flown to Asia a few times so he's a pro. It turns out 11 hours on an overnight flight when you haven't slept for more than 5 hours in the two previous nights is cake. I was asleep before the plane took off, and aside from a brief period of being awake around midnight, I slept until about 2 hours before we landed. 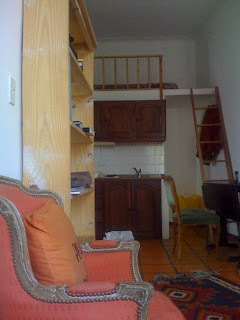 Our apartment is in Palermo Soho, a neighbourhood laden with shops, restaurants, and bars. The apartment itself is super-sweet - it was describe as a studio but I think will be plenty of room for us and the occasional visitor. I noticed a couple of roaches when we first got here and christened them Wally and Eva. On our return from dinner this evening we found that Wally and Eva have a whole family who apparently live in our walls, and didn't scurry away quite quickly enough when we turned on the lights. We added roach traps and spray to our shopping list for tomorrow. On our post-nap venture this evening we found the local supermarket (at which we purchased the requisite jar of dulce de leche) and a gym that's quite reasonably priced at around $35/month. Tomorrow afternoon I have an interview with the school at which I'm hoping to take a certificate course so that I can teach English at some point, and tomorrow night we have our first social engagement! Friends of ours from San Francisco are here on vacation and we're meeting them for dinner. Porteños [locals] eat late, so we're meeting them at 9 or 10. Both of us are kind of stunned, like, holy crap, we live in Buenos Aires. can i just say: OH MY GO YOU LIVE IN BUENOS AIRES.